Today the S&P 500 declined by 1.24%, which is the first daily decline of more than 1% since the year began. It’s been about a month since the last time that the index fell by 1% in a given day. Since 1990, the S&P 500 declines by 1% 32 times in an average year. Today’s decline, which comes 12 days into 2014, puts us on near perfect pace for an average year of volatility by this measure. 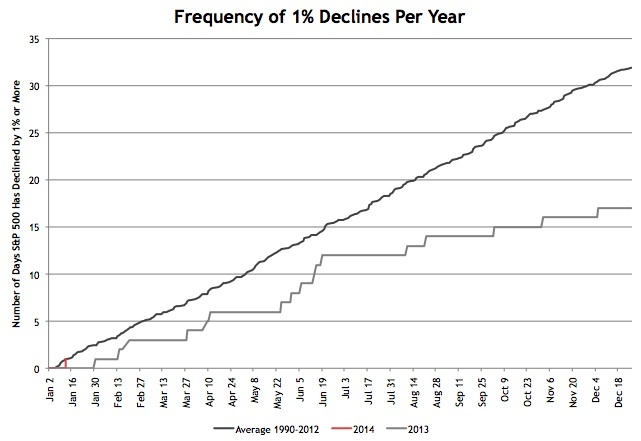 Last year was a benign year for markets, and only saw 17 daily declines of 1% or more. It’s of course too soon to draw any conclusions about 2014, but at least in this respect there wasn’t anything out of the ordinary about today’s decline.